You've Got Mail meets How to Eat a Cupcake in this delightful novel about a talented chef and the food critic who brings down her restaurant--whose chance meeting turns into a delectable romance of mistaken identities. Don't miss Amy's newest work of women's fiction: The Optimist's Guide to Letting Go! In downtown Milwaukee, Wisconsin, Lou works tirelessly to build her beloved yet struggling French restaurant, Luella's, into a success. She cheerfully balances her demanding business and even more demanding fiancé...until the morning she discovers him in the buff--with an intern. Witty yet gruff British transplant Al is keeping himself employed and entertained by writing scathing reviews of local restaurants in the Milwaukee newspaper under a pseudonym. When an anonymous tip sends him to Luella's, little does he know he's arrived on the worst day of the chef's life. The review practically writes itself: underdone fish, scorched sauce, distracted service--he unleashes his worst. The day that Al's mean-spirited review of Luella's runs, the two cross paths in a pub: Lou drowning her sorrows, and Al celebrating his latest publication. As they chat, Al playfully challenges Lou to show him the best of Milwaukee and she's game--but only if they never discuss work, which Al readily agrees to. As they explore the city's local delicacies and their mutual attraction, Lou's restaurant faces closure, while Al's column gains popularity. It's only a matter of time before the two fall in love...but when the truth comes out, can Lou overlook the past to chase her future? 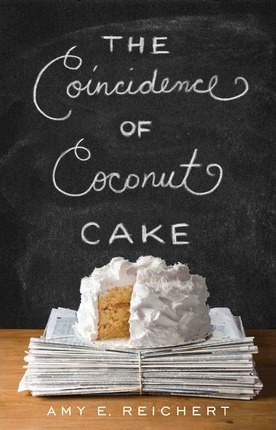 Set in the lovely, quirky heart of Wisconsin, The Coincidence of Coconut Cake is a charming love story of misunderstandings, mistaken identity, and the power of food to bring two people together.